microRNAs (miRNAs) have been shown to regulate the expression of a large number of genes and play key roles in many biological processes. Several previous studies have quantified the inhibitory effect of a miRNA indirectly by considering the expression levels of genes that are predicted to be targeted by the miRNA and this approach has been shown to be robust to the choice of prediction algorithm. Given a gene expression dataset, Cheng et al. defined the regulatory effect score (RE-score) of a miRNA as the difference in the gene expression rank of targets of the miRNA compared to non-targeted genes. Using microarray data from parent-offspring trios from the International HapMap project, we show that the RE-score of most miRNAs is correlated between parents and offspring and, thus, inter-individual variation in RE-score has a genetic component in humans. Indeed, the mean RE-score across miRNAs is correlated between parents and offspring, suggesting genetic differences in the overall efficiency of the miRNA biogenesis pathway between individuals. To explore the genetics of this quantitative trait further, we carried out a genome-wide association study of the mean RE-score separately in two HapMap populations (CEU and YRI). No genome-wide significant associations were discovered; however, a SNP rs17409624, in an intron of DROSHA, was significantly associated with mean RE-score in the CEU population following permutation-based control for multiple testing based on all SNPs mapped to the canonical miRNA biogenesis pathway; of 244 individual miRNA RE-scores assessed in the CEU, 214 were associated (p < 0.05) with rs17409624. The SNP was also nominally significantly associated (p = 0.04) with mean RE-score in the YRI population. Interestingly, the same SNP was associated with 17 (8.5% of all expressed) miRNA expression levels in the CEU. We also show here that the expression of the targets of most miRNAs is more highly correlated with global changes in miRNA regulatory effect than with the expression of the miRNA itself. We present evidence that miRNA regulatory effect is a heritable trait in humans and that a polymorphism of the DROSHA gene contributes to the observed inter-individual differences. microRNAs (miRNAs) are a class of small non-coding RNA molecules of approximately 21 nucleotides in length that regulate gene expression. They typically bind to complementary loci in the 3′ untranslated region (UTR) of mRNA and prevent translation to mature protein. An individual miRNA can regulate the expression of hundreds of genes. Some genes, particularly those with longer 3′ UTRs, are often the targets of multiple miRNAs and consequently, miRNA mediated regulation tends to result in the fine tuning of the expression of many proteins within a cell [1, 2]. In mammals, miRNAs are thought to regulate the expression of as many as 50% of protein coding genes . miRNA expression impacts on almost every cellular process and miRNA dysregulation has been implicated in many pathologies [1, 4]. miRNAs regulate a range of biological pathways associated with cancer including apoptosis  and cell proliferation ; dysregulation of miRNAs has also been widely observed in cancer . For example over expression of miR-155 has been implicated in Hodgkin’s and Burkitt’s lymphoma , while miR-15 and miR-16, which target the anti-apoptotic gene BCL2, have been shown to be dysregulated in chronic lymphocytic leukemia . miRNAs have been found in many of the genomic regions associated with chromosomal abnormalities in cancer, including regions of amplification, which may contain oncogenes, regions of loss of heterozygosity, which may harbor tumor suppressor genes and fragile sites which are preferential sites for translocation, deletion, amplification, sister chromatid exchange and insertion of tumor associated viruses like human papilloma virus . While many specific maturation steps have been uncovered for different miRNAs, most known human miRNAs are processed in the same way by the miRNA biogenesis pathway. miRNA precursors, known as primary miRNA (pri-miRNA) are transcribed by RNA polymerase II or III. These transcripts are subsequently cleaved by the microprocessor complex DROSHA-DGCR8 to form the pre-miRNA, which is transported from the nucleus to the cytoplasm by XPO5-RAN-GTP. There, it is cleaved by DICER1-TRBP to form the two stranded miRNA duplex; the passenger strand is detached and normally degraded, although in some cases it acts as a separate functional miRNA. The remaining functional strand combines with E1F2C2 proteins and forms the RNA-induced silencing complex (RISC). The miRNA then guides RISC to prevent translation of target mRNAs. Translation is prevented by mRNA deadenylation, mRNA target cleavage or translational repression . Of the mechanisms of post-transcriptional regulation by miRNAs, lowered mRNA levels (mRNA cleavage or deadenylation) accounts for most (> 84%) of decreased protein production . This implies that it is possible to assess levels of miRNA mediated gene silencing from the mRNA levels of a miRNA’s target transcripts. Cheng et al. quantified miRNA activity in this way by defining the regulatory effect score (RE-score) of a miRNA in a sample as the average expression rank of genes that are not predicted to be targeted by the miRNA minus the average expression rank of the predicted targets of the miRNA . Thus, the RE-score is intended to measure the extent to which targets of the miRNA are downregulated in a sample relative to other genes. It is not informative to compare the RE-scores of different miRNAs, but comparison of the RE-score of a given miRNA between samples can provide an indication of a difference in the repressive effect of the miRNA in the samples. For example, if the targets of a given miRNA relative to non-targets are ranked higher in a set of cancer samples than in comparable normal tissues, this suggests that the miRNA exerts less control over gene expression in the cancer samples. There have been numerous other studies published that have also investigated miRNA regulation by assessing changes in expression of mRNA targets [14–18]. We sought to investigate whether there is evidence of natural variation in this phenotype between human individuals using RE-scores calculated from microarray and RNA-seq data generated from the CEU (Utah residents with ancestry from northern and western Europe) and YRI (Yoruba in Ibadan, Nigeria) lymphoblastoid cell lines of the HapMap project [19–23]. Microarray data were available for 56 trios of related individuals in these populations (consisting of two parents and an offspring). We used these data to investigate the genetic component of the variation in RE-scores. Positive correlation between the value of a phenotype in an offspring and the mean value in parents provides evidence of a heritable component in the variation of the phenotype and the slope of the linear regression line relating parent mean to offspring values can be used as an estimate of the narrow-sense heritability [24–26]. Microarray data  were obtained for 56 trios (both parents and an offspring) from the CEU and YRI populations of the HapMap project [19, 20]. Using miRNA targets predicted by TargetScan [2, 27] we compared RE-scores between parents and offspring. For 51% of miRNAs the mean RE-score of parents and the RE-score of the offspring were significantly (p < 0.05) positively correlated (Table 1). Population of origin was included in these regressions to model biological and technical differences between the CEU and YRI cell lines. Regression p-values and slopes for heritability of individual miRNA RE-scores from TargetScan and a second miRNA prediction algorithm (PicTar ) are provided as Additional file 1; histograms of these p-values are shown in Additional file 2: Figure S1. We calculated the mean of the RE-score over all miRNAs. Unsurprisingly, the mean RE-score is also strongly correlated between parents and offspring in HapMap trios (Figure 1). This correlation is statistically significant using mean RE-scores calculated from targets predicted by TargetScan (slope = 0.68 ± 0.34; p = 2 × 10−4). The slopes of these regression lines provide estimates of the narrow-sense heritability of the mean RE-score. We also assessed mean RE-score heritability based on targets predicted by four other algorithms (which have been found to be less accurate predictors of protein levels ). Of these PicTar (slope = 0.62 ± 0.36; p = 1.3 × 10−3), miRanda (slope = 0.40 ± 0.37; p = 3.6 × 10−2) and mirTarget2  (slope = 0.35 ± 0.32; p = 2.8 × 10−2) showed significant evidence of heritability, while one miRNA target prediction algorithm, mirBase , did not reach statistical significance (slope = 0.20 ± 0.33; p = 0.21). Heritability of mean RE-score. 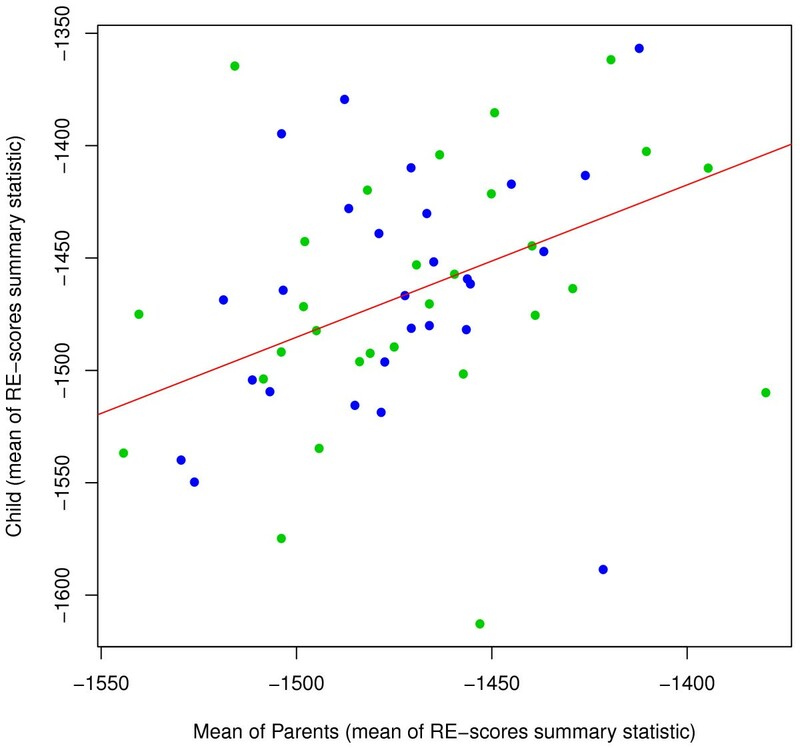 Scatter plots of child values of mean RE-score against mean value of parents. Points from the CEU are colored blue and YRI are green. The estimated regression line is shown in red. RE-scores were calculated using TargetScan. It is possible that the apparent genetic contribution to the regulatory effect of miRNAs is a consequence of the heritability of gene expression, rather than a novel molecular phenotype. Since the expression levels of a large proportion of human genes have a strong genetic component [33–35], the correlation in RE-score between parents and offspring could simply reflect the correlation in the expression levels of a proportion of the genes targeted by the miRNA. We devised a permutation test to evaluate this possibility. For each set of mRNAs predicted to be targeted by a given miRNA we replaced predicted target genes by genes chosen at random (details in Methods). If the apparent heritability of RE-scores is merely a consequence of heritability of individual gene expression levels, the RE-scores obtained from sets of random genes should exhibit similar levels of heritability to the RE-scores based on the true predicted target sets. Greater evidence of heritability from true predicted targets compared to sets of randomly selected genes suggests that the RE-score heritability cannot be explained by the heritability of individual gene expression levels. Of 1,000 randomizations, just eight (p = 0.008) reached a regression p-value as extreme as the target sets predicted by TargetScan. In order to explore the genetic contribution to RE-score variation further, we carried out a genome-wide association (GWA) test, treating mean RE-score, calculated using miRNA targets predicted by TargetScan, as a quantitative trait, and using genotype data from the HapMap project [19, 20]. To avoid artifacts resulting from population structure, we carried out these tests separately on the CEU and YRI samples and excluded related individuals (offspring of the HapMap trios). RE-scores were recalculated using expression data derived from RNA-seq [21, 22], which was available for parents but not for offspring of HapMap trios. Histograms and Manhattan plots of p-values are shown in Additional file 2: Figure S2. The p-value distributions show a peak towards low p-values, suggesting the presence of some true positive associations. The top ten most significantly associated loci in both populations are shown in Additional file 3. None of these associations remained significant following a permutation-based correction for multiple testing. This is not surprising given the relatively small number of samples compared to typical GWA studies. Cheng et al. used the RE-score metric to compare miRNA repression in Estrogen Receptor Positive (ER+) and Estrogen Receptor Negative (ER-) breast cancers and found that miRNAs tended to have higher RE-scores (i.e. their targets were more repressed) in the latter. The differences in RE-scores between the two cancer subtypes was attributed to dysregulation of key genes in the microRNA biogenesis pathway . We used linear regression to investigate the relationships between seven key genes in the miRNA biogenesis pathway, (DICER1, EIF2C2, DROSHA, DGCR8, XPO5, RAN and TRBP) and mean RE-score, first using all samples from both populations pooled (including population of origin as a factor in the model) and then in each of the populations separately. Expression levels of five of these seven genes were significantly correlated with mean RE-score (Table 2), consistent with a contribution of differential regulation of the miRNA biogenesis pathway to differences in mean RE-score. In fact, a large proportion (37.8%) of all genes were significantly associated (p < 0.05) with mean RE-score; however, this proportion was somewhat higher (five out of seven, or 71.4%) for genes in the miRNA biogenesis pathway. Given this relationship between RE-score and the activities of genes in the miRNA biogenesis pathway these genes are worthy of closer examination for genetic association with mean RE-score. P-values and slopes from the linear regression of expression level of genes in the miRNA biogenesis pathway against mean RE-score, in the CEU, YRI and for both populations pooled. We carried out a second test of association, restricting to 336 SNPs that map to the genomic regions of these seven key genes involved in the miRNA biogenesis pathway. A SNP is mapped to the genomic region of a gene by dbSNP if it lies between 2kb upstream and 500bp downstream of the gene. Again there appear to be more low p-values than would be expected under the uniform distribution, pointing to a proportion of true positive associations in both populations (Additional file 2: Figure S3). The ten SNPs most strongly associated with mean RE-score in CEU and YRI are shown in Tables 3 and 4, respectively. One SNP, rs17409624, in an intron of DROSHA remained statistically significantly (p adjusted < 0.05) associated with mean RE-score in the CEU following Bonferroni and permutation-based control for multiple testing. This SNP was also nominally significantly associated with mean RE-score in the YRI (p = 0.04); however, the minor allele frequency was much lower in YRI, limiting the power to detect an association with a significance that could survive multiple test correction. The magnitude and direction of the RE-score differences between genotypes are consistent across the two populations (Figure 2). Taken individually, the vast majority (214 of 244) of RE-scores are associated (p < 0.05) with genotype at this SNP in the CEU. This number drops to 36 of 244 in the YRI, however the lower minor allele frequency in YRI again limits the power to detect the association. The results for association of miRNA biogenesis pathway related SNPs with mean RE-score in the CEU. Stripcharts for rs17409624. Stripcharts of mean RE-score against genotype at rs17409624 in the (a) CEU and (b) YRI populations. As a further test of the association between rs17409624 and mean RE-score, we investigated the RE-scores of a particular class of intronic miRNAs (mirtrons), which are not processed by DROSHA. If the association between the SNP and mean RE-score is real and is mediated by an effect on miRNA processing by DROSHA, the SNP should not be associated with the RE-scores of mirtrons. Consistent with this prediction, we found that a much lower proportion of mirtron RE-scores (based on TargetScan predictions from CEU RNA-seq data) are associated (at α = 0.05) with the DROSHA SNP (5 out of 12 mirtrons, compared to 214 out of 244 conventional miRNAs; p = 0.0004, from a two-sided Fisher’s exact test). We have found evidence that the subset of mirtrons that do show an association with the SNP do so because of an overlap between their target gene sets and the target gene sets of conventional miRNAs, as the mirtrons which are most significantly associated with rs17409624 tend to target genes that are also targeted by many other miRNAs; and mirtrons that target genes that are targeted by few conventional miRNAs are less significantly associated with rs17409624 (Additional file 2: Figure S4). We investigated the function of SNP rs17409624 using the “SNP Function Prediction” tool, which is part of the SNPinfo suite (available at http://www.niehs.nih.gov/snpinfo) ; however, no significant results were identified. We also searched the “GWAS Catalog” but did not find any previous studies which had identified this SNP . To search for other SNPs that may be causally responsible for this association we used confidence intervals  as implemented in HaploView to calculate haplotype blocks for the CEU HapMap data. 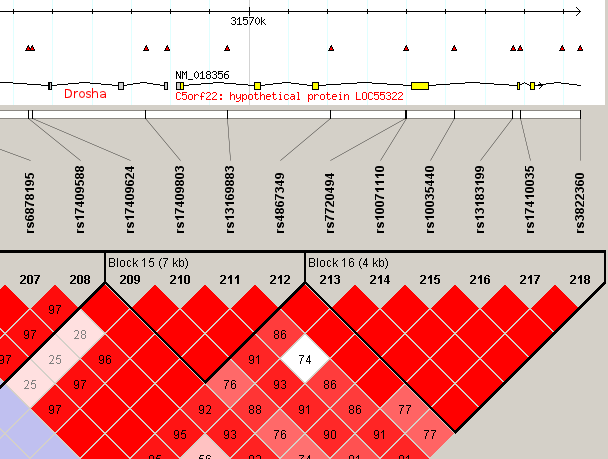 rs17409624 is located within a haplotype block that includes the DROSHA promoter region (Figure 3). We verified that this is the active promoter of DROSHA using data recently released by the ENCODE project et al.. Chromatin states for this locus are shown in Additional file 2: Figure S5. The expression level of DROSHA is significantly associated with mean RE-score (Table 2); however, the genotype of this locus was not significantly correlated with DROSHA expression level (p = 0.39) or with the relative expression level of any DROSHA transcript isoforms (identified using Cufflinks ). 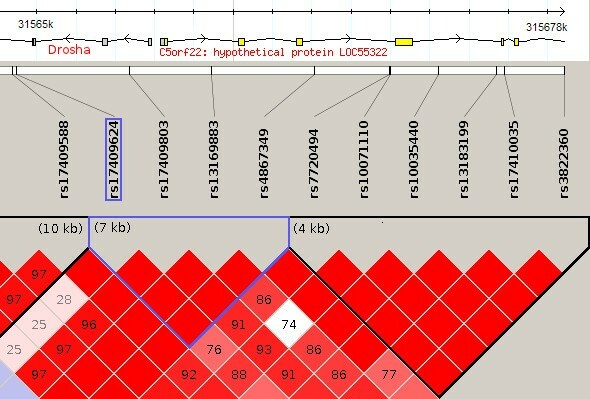 A further possibility is that rs17409624 is in linkage disequilibrium (LD) with an exonic SNP that was not genotyped on the HapMap microarrays. Using SNP calls from genome sequence data released by the 1,000 Genomes Project  we found no coding SNPs with a stronger association to mean RE-score than rs17409624, the regions assayed included the 3′ and 5′ UTRs. We caution however, that there was much less statistical power to detect an association using the 1,000 Genomes data, as there was an overlap of only 45 samples between the 1,000 Genomes Project dataset (versus 59 for the HapMap microarray data) and the RNA-seq samples from the CEU used in this analysis, which means that it is difficult to rule out the possibility of linkage of rs17409624 with a causative SNP in the coding region. These results are provided in Additional file 4. Thus, the causal mechanism linking genetic variation at the DROSHA locus to variation in the RE-score remains unclear. Haplotypes in rs17409624 region. Haplotype blocks around rs17409624 as calculated by confidence intervals in Haploview, using the HapMap CEU data. The block which includes rs17409624 is highlighted in blue; this block also includes the DROSHA promoter region. miRNA expression data has recently been generated for some of the HapMap CEU and YRI cell lines . In the majority of cases, miRNA expression levels and their corresponding RE-scores were not significantly correlated. Average Spearman correlation between miRNA expression and corresponding TargetScan based RE-score from the RNA-seq data is only 0.009 in the CEU and -0.0003 in the YRI. Although surprising, this observation is consistent with the findings of Cheng et al. , who, for the original RE-score study, performed Spearman correlations of the t-scores of comparisons of miRNA expression and RE-scores between ER- and ER+ breast cancers, finding only very weak positive correlation. Similar results have also been observed on two separate datasets by Liang et al.. Correlations between miRNA expression level and RE-scores are included in Additional file 5. However, we find that in the CEU, the expression of 17 of 201 miRNAs that were consistently expressed across the cell lines is associated (p<0.05) with rs17409624 and that 13 of these associations are in the same direction as mean RE-score. One miRNA is associated with the SNP in the YRI, but once again, the lower minor allele frequency of rs17409624 in the YRI limits the power to identify associations. P-values and false discovery rates for these 18 miRNAs (17 CEU and 1 YRI) for genotype association are included in Additional file 6. Thus, this SNP represents a trans-eQTL cluster for miRNA gene expression. We hypothesize that this trans-eQTL reflects inter-individual differences in the efficiency of miRNA processing by DROSHA. Given that miRNA expression measurements are relative (in this case miRNA expression was measured using a pooled reference microarray design), it is possible that this polymorphism may affect the absolute copy numbers of a large fraction of miRNAs, even though an association between miRNA expression and the SNP is detectable for a relatively small fraction of miRNAs. This hypothesis could be tested using transcriptome sequencing strategies designed to measure the abundance of miRNAs relative to other RNA species. Indeed, given a global and consistent change in expression of all miRNAs in a sample, one may not expect the expression of any miRNAs to be associated with rs17409624, as the proportion of the transcript pool occupied by any given miRNA, would remain unchanged. However, the miRNA regulatory effect polymorphism need not affect the expression of all miRNAs to exactly the same degree, potentially leading to both positive and negative associations of miRNA expression with the SNP. As discussed above, RE-scores of the majority of miRNAs were not correlated with miRNA expression. This remained the case when we restricted to miRNAs whose expression varied most across samples. However, the RE-scores of individual miRNAs were correlated with the mean RE-score calculated across all miRNAs. We restricted this analysis to the 20 most variable miRNAs. Of the top 20 in either population, 14 in the CEU and 13 in the YRI had TargetScan prediction data and therefore RE-scores. We only considered these highly variable miRNAs because quantities that are relatively constant across samples are not expected to be correlated, given the noise inherent in microarray data. The correlation between mean and individual miRNA RE-scores is not simply a consequence of overlaps in genes targeted by different miRNAs, since it holds true even when the mean RE-score is recalculated, for each miRNA correlation test, after all of the individual miRNAs targets have been subtracted from the target sets of the remaining miRNAs. 13 of the 14 highly varying miRNAs in the CEU and all 13 of 13 in the YRI show a stronger association between the individual RE-score and (subtracted) mean RE-score, than between the individual RE-score and the expression of the miRNA itself. In most cases this difference is large (Additional file 7), hence, the mean RE-score in a sample may be a much better predictor of the expression level of the targets of any particular miRNA, than is the expression profile of the miRNA itself. It is, perhaps, not surprising that the expression level of an individual miRNA is not indicative of the expression of its target genes, given that targeted genes are often targets of a large number of miRNAs. Of 11,759 genes which are predicted to be targeted by at least one miRNA (by the full TargetScan set), the average number of miRNAs targeting each gene is 17.48. In this context, the fact that the mean RE-score has power to predict the expression levels of a miRNA target, even when the mean RE-score is calculated without considering the targets of that miRNA is interesting and points to differences in the effect of the miRNA pathway on target genes across the cell lines. We have found evidence of heritability of the regulatory effect of miRNAs in human. We have also identified an association between the regulatory effect of miRNAs and a SNP in the miRNA processing gene DROSHA. This association was identified in lymphoblastoid cell lines and it remains to be seen whether and in which primary cells the regulatory effect of miRNAs is associated with the DROSHA locus. As noted in the Background, Cheng et al. had observed that there is a change in miRNA RE-scores between ER- and ER+ breast cancer subtypes. Thomsom et al. showed that mature miRNA levels are generally lower in several human primary cancers, despite unchanged pri-miRNA levels and this has been attributed to defective processing by DROSHA, while DROSHA and DICER have also been shown to be downregulated in endometrial cancer and specific subgroups of breast cancer [46, 47]. Thus, it will be important to investigate further the phenotypic consequences of inter-individual differences in miRNA regulatory efficiency and the influence on gene expression, possible tumorigenesis and the impact of such inter-individual differences in the context of the use of miRNAs as biomarkers. Raw gene expression microarray data of related individuals from the CEU and YRI populations of the HapMap project were downloaded from GEO under accession number GSE7792, these data were generated by Huang et al. using Affymetrix Human Exon 1.0 ST microarrays. Prior to calculating gene expression level estimates, the data were RMA normalized  and genes whose expression level were below the detection threshold, as estimated by the DABG algorithm (p < 0.05), were set to zero; these steps were performed using Affymetrix Power Tools and R as described in . RNA-seq data for unrelated individuals of the HapMap YRI population were generated by Pickrell et. al and we obtained these aligned data from GEO under accession number GSE19480. Similarly, Montgomery et al. used RNA-seq to assess gene expression of unrelated CEU samples and these data were obtained from ArrayExpress under accession number E-MTAB-197. All data were aligned to hg18 using MAQ . We performed gene expression analysis using R/Bioconductor. Data were loaded in R  using the ShortRead library. Following Montgomery et al., only reads that had a mapping quality score of greater than or equal to 10 were included. The GenomicRanges library was used to compute the number of reads mapping to exons of each gene and expression values were normalized using the RPKM  procedure. miRNA prediction data were obtained using the R library RmiR.Hs.miRNA which provides a database of miRNA targets for several widely used algorithms. The HapMap release 28 (merged data for phases I, II and III) [19, 20] SNP data were downloaded from the HapMap website, converted to GenABEL format and trimmed to include only samples in the CEU and YRI populations for which there was matching RNA-seq data. Narrow sense heritability of individual miRNA RE-scores and mean RE-score was estimated using a robust linear regression model [24, 25]. The rlm() function from the R library MASS was used to fit regression models for child value dependent on mean of parents. Population of origin was included as a factor in the models. The slope of the regression line provides an estimate of heritability. To calculate a corrected p-value for heritability of mean RE-score of a miRNA prediction algorithm, we performed 1,000 permutations of the prediction algorithm’s miRNA gene target sets and recalculated heritability of mean RE-score following each permutation; the permutation p-value was the proportion of permuted sets that return p-values which are equal to, or lower than, the original raw p-value for that algorithm. To perform a permutation, we replace each gene target of each miRNA’s target set with a randomly chosen gene, but only genes for which expression data is available are replaced or used for replacement, as only these can affect RE-scores. If a gene is a target of multiple microRNAs, it is replaced by the same randomly chosen gene in every target set, so as to maintain the structure of the data. The R package GenABEL[56, 57] was used for filtering and tests of association. Prior to testing for association, genotype data were filtered as follows. Obvious close relatives are removed by discarding the child samples and to avoid the effects of population stratification CEU and YRI samples are assayed separately. Markers with a low minor allele frequency were filtered by excluding SNPs for which there were less than 5 copies of the minor allele across all samples. We used only SNPs genotyped as part of HapMap phase III. Individuals or SNPs were excluded for a call rate of < 0.95. Tests for Hardy-Weinberg equilibrium were conducted using Pearson’s χ2, comparing observed genotype frequencies in the data to the calculated expected frequencies; a cut-off FDR level of 0.2 was applied. To assess if any remaining relatedness exists among the samples, the pairwise proportion of alleles identical-by-state (IBS) was calculated between all individuals based on 2,000 randomly chosen autosomal markers, ensuring IBS < 0.95 for all samples. For multiple testing correction of association p-values, permutations were calculated by permuting phenotype labels and performing tests of association as normal; for each raw p-value, we computed the number of permutations for which a p-value equal to, or lower than, the original raw p-value was reached and divide this by the number of permutations, the result of which is the adjusted p-value. False discovery rates were also assessed using the R package qvalue. For each of 14 highly varying miRNAs in the CEU samples and 13 in the YRI, we fit a multiple linear regression model of individual miRNA RE-score dependent on the expression of the miRNA and the mean RE-score. For each fit of the model, mean RE-score was re-calculated with the genes that are targets of the particular individual miRNA removed from the gene expression matrix, so as to avoid a bias in the association between the two variables. PG performed the analysis and drafted the manuscript. CS conceived the study. CS and AG directed the project. RSH and ERG generated the miRNA expression data and provided guidance on analysis. All authors read and approved the final manuscript. PG is supported by the Irish Research Council for Science, Engineering and Technology (IRCSET) Embark Initiative’s Enterprise Partnership Scheme. RSH receives support from NIH/NCI grant R21 CA139278, NIH/NIGMS grant K08GM089941, University of Chicago Cancer Center Support Grant (#P30 CA14599) and Breast Cancer SPORE Career Development Award. CS is supported by Science Foundation Ireland (07/SK/M1211b).